Elephants, the largest land animals on the planet, are among the most exuberantly expressive of creatures. Joy, anger, grief, compassion, love; the finest emotions reside within these hulking masses. Through years of research, scientists have found that elephants are capable of complex thought and deep feeling. In fact, the emotional attachment elephants form toward family members may rival our own. In the wild, joy is an emotion that elephants have no shame in showing. They express their happiness and joy when they are amongst their loved ones-family and friends. Playing games and greeting friends or family members all elicit displays of joy. But the one event that stirs a level of elephant happiness beyond compare is the birth of a baby elephant. In Echo: An Elephant to Remember, the birth of Ebony is one such occasion. The excitement of several of the females in Echo’s family can’t be contained as they are heard bellowing and blaring during the birth of the new baby. Another highly emotional occasion in an elephant’s life is an elephant reunion. This joyful meeting between related, but separated, elephants is one of exuberance and drama. The greeting ceremony marks the incredible welcoming of a formerly absent family member. During the extraordinary event, the elephants about to be united begin calling each other from a quarter a mile away. As they get closer, their pace quickens. Their excitement visibly flows as fluid from their temporal glands streams down the sides of their faces. Eventually, the elephants make a run towards each other, screaming and trumpeting the whole time. When they finally make contact, they form a loud, rumbling mass of flapping ears, clicked tusks and entwined trunks. The two leaning on each other, rubbing each other, spinning around, even defecating, and urinating (for this is what elephants do when they are experiencing sheer delight). With heads held high, the reunited pair fill the air with a symphony of trumpets, rumbles, screams, and roars. Bliss. There is no greater love in elephant society than the maternal kind. Nobody who observes a mother with her calf could doubt this. It is one of the most touching aspects of elephant social customs. The calf is so small compared to the adult that it walks under its mother, who, incredibly, does not step on it or trip over it. Mother and child remain in constant touch. If a calf strays too far from its mother, she will fetch it. The mother often touches her child with trunk and legs, helping it to its feet with one foot and her trunk. She carries it over obstacles and hauls it out of pits or ravines. She pushes it under her to protect it from predators or hot sun. She bathes it, using her trunk to spray water over it and then to scrub it gently. The mother steers her calf by grasping its tail with her trunk, and the calf follows, holding its mother’s tail. When the calf squeals in distress, its mother and others rush to its protection immediately. It is easy to see why the bond between mother and daughter lasts 50 years or more. One of the most moving displays of elephant emotion is the grieving process. 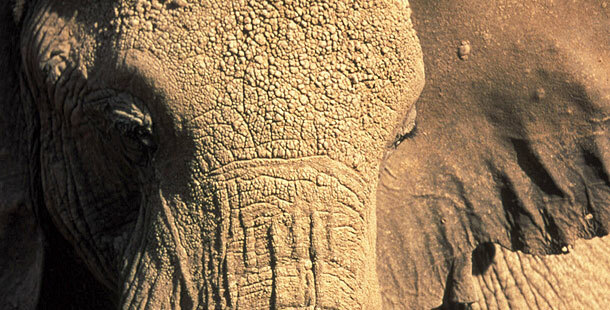 Elephants remember and mourn loved ones, even many years after their death. When an elephant walks past a place that a loved one died he or she will stop and take a silent pause that can last several minutes. While standing over the remains, the elephant may touch the bones of the dead elephant (not the bones of any other species), smelling them, turning them over and caressing the bones with their trunk. Researchers don’t quite understand the reason for this behavior. They guess the elephants could be grieving. Or they could they be reliving memories. Or perhaps the elephant is trying to recognize the deceased. Whatever the reason, researchers suspect that the sheer interest in the dead elephant is evidence that elephants have a concept of death. Researchers have described mother elephants who appear to go through a period of despondency after the death of a calf, dragging behind the herd for days. They’ve also witnessed an elephant herd circling a dead companion disconsolately. After some time, and likely when they realized the elephant was dead, the family members broke off branches, tore grass clumps and dropped these on the carcass. Another researcher noted a family of African elephants surrounding a dying matriarch. The family stood around her and tried to get her up with their tusks and put food in her mouth. When the rest of the herd finally moved on, one female and one calf stayed with her, touching her with their feet. Terror, rage and stress, unfortunately, are also commonplace in the elephant repertoire of emotions. Terror afflicts baby African elephants who wake up screaming in the middle of the night after they have witnessed their families murdered and poached — a type of Post Traumatic Stress Disorder. Some researchers suggest a species-wide trauma is taking place in wild elephant populations. They say that elephants are suffering from a form of chronic stress after sustaining decades of killings and habitat loss. The recent surge in cases of wild elephant rage reported by the media is a sad indicator of the kind of stress that wild elephants are undergoing. Nearly 300 persons are killed every year by wild elephants in India. But the increasing numbers of deaths are closely correlated to the ever-increasing human presence in traditional wild elephant habitats, as well as the the effects of climate change, and loss of territory and resources. The ongoing competition between elephants and humans for available land and resources is leading to ever more unfortunate and often deadly consequences. Human activity does more than put a stress on elephants to find resources. It can often disrupt the complex and delicate web of familial and societal relations that are so important in elephant society. Calves are carefully protected and guarded by members of the matriarchal elephant family. Any perception of danger triggers a violent reaction from the matriarch and, subsequently, the entire family. The extremes a family will go to protect a vulnerable new calf are reported in the news stories as fits of unprovoked “elephant rage.” Charging a village, storming into huts where harvested crop is stored, plundering fields and, if disturbed, turning violent are some of the instances reported by the media. Compassion is not reserved for offspring alone in elephant society. Elephants appear to make allowances for other members of their herd. Observers noted that one African herd always traveled slowly because one of its members had never recovered from a broken leg. And in another case, a park warden reported a herd that traveled slowly because one female was carrying around a dead calf. One perplexing report was of an adult elephant making repeated attempt to help a baby rhinoceros stuck in the mud. She continued to try to save the baby rhino despite the fact that its mother charged her each time. Risking her life for the sake of an animal that is not her own, not related to her, or even her own species is remarkably altruistic in nature. While there is a great deal more to learn about what elephants feel, such accounts are astonishing. They reveal a creature that weeps, revels, rages and grieves. They lead us to believe that the depth of elephant emotional capacity knows no limit. They are striking for they suggest that elephants act on feelings and not solely for survival.